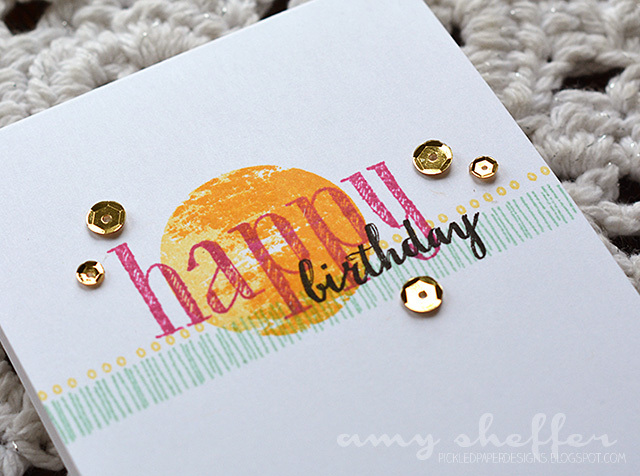 I'm having a blast with Stamp-a-faire today -- hope those of you who are participating are too! The projects I've seen so far have been so creative and such fun to see! 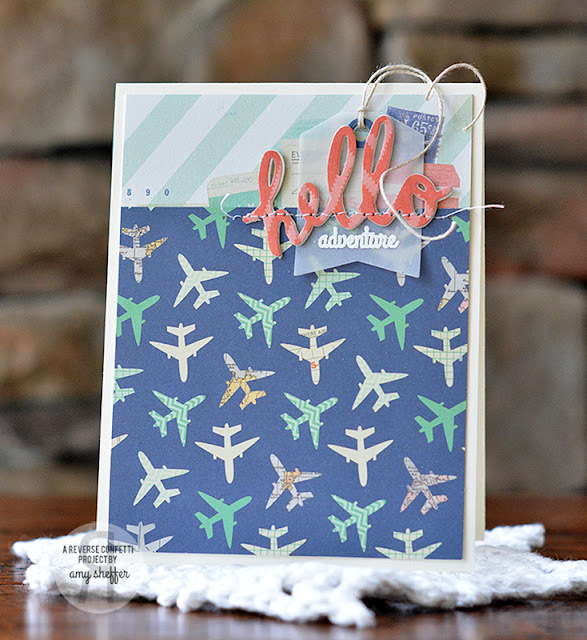 Just popping in now to let you know about a Stamp-a-faire challenge I'm hosting -- Stitching With Needles. 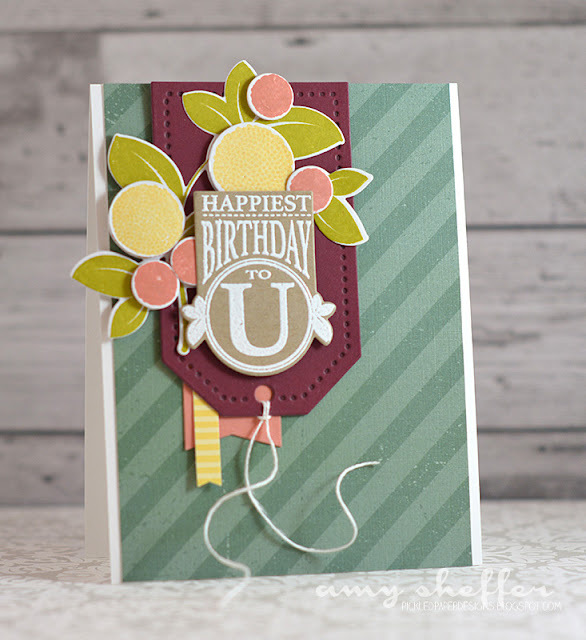 You'll find all the challenge info, as well as link to a Machine Stitched video tutorial, over on Nichole's blog. In the video, I share a fun metallic thread that I love using, as well as tips for stitching around circular or other non-linear shapes. Stitching is one of my favorite techniques. 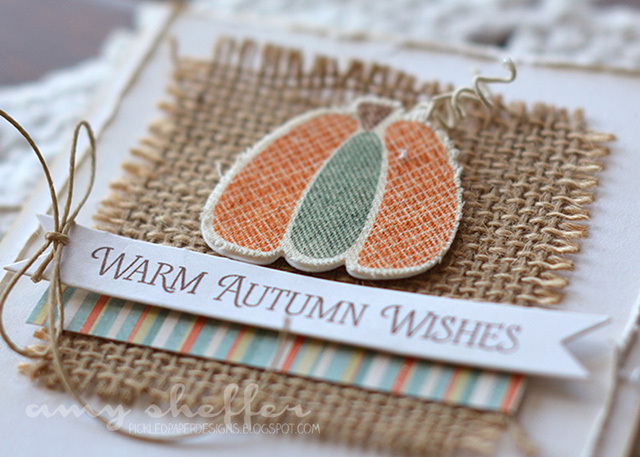 I love the subtle texture stitching adds and the homespun quality it can give a project. Often my stitching is more decorative, but it's also a practical alternative to adhesives, particularly with vellum or acetate! 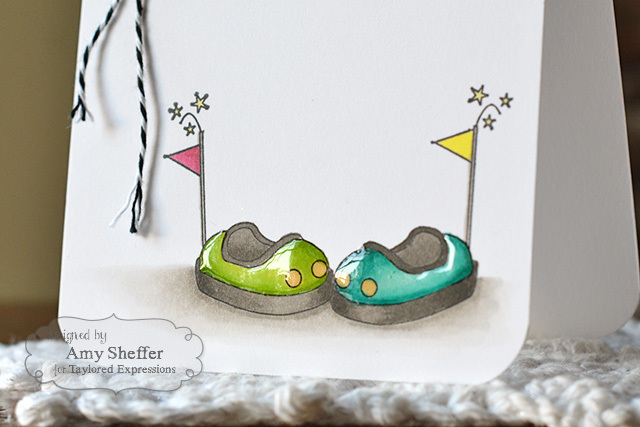 I am challenging Stamp-a-faire participants to add machine stitching to their cards. Hope you'll play along! I look forward to seeing all the creations! 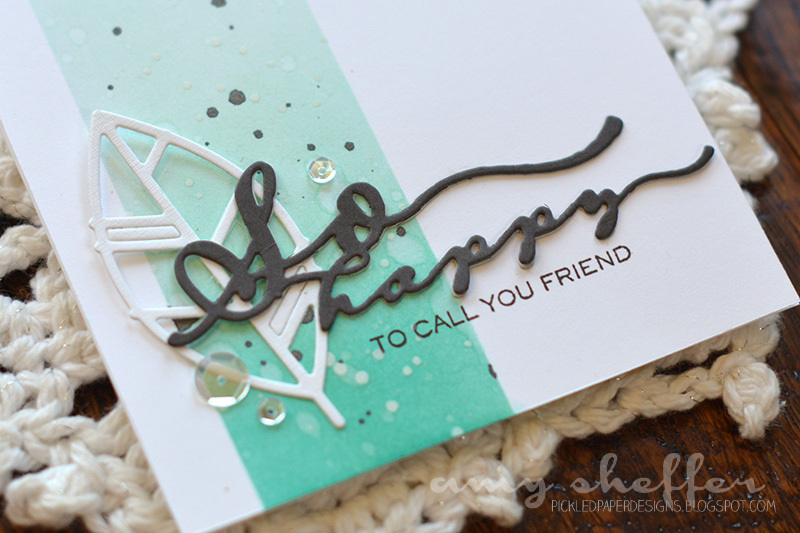 Here I've used the fun metallic thread to stitch on my sentiment die-cut. 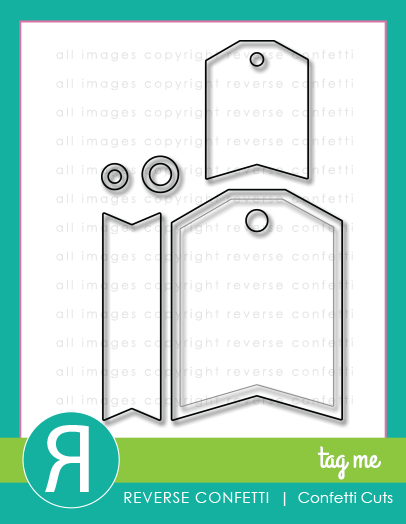 And here I've added stitching around the die-cut frame. Hope you'll join me for this challenge. And swing by the PTI forum to chat! 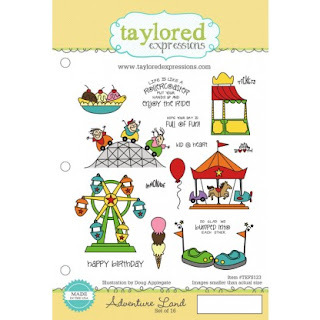 Join me over on the Taylored Expressions blog today for more of this cute bumper car card, featuring Taylored Expressions' Adventure Land stamp set. Stamp-a-faire is off and running! 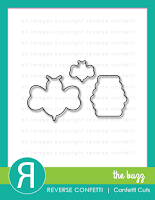 The first challenge, a Bridal Challenge, has been posted, and now it's time for our second challenge, the Patterns Challenge. 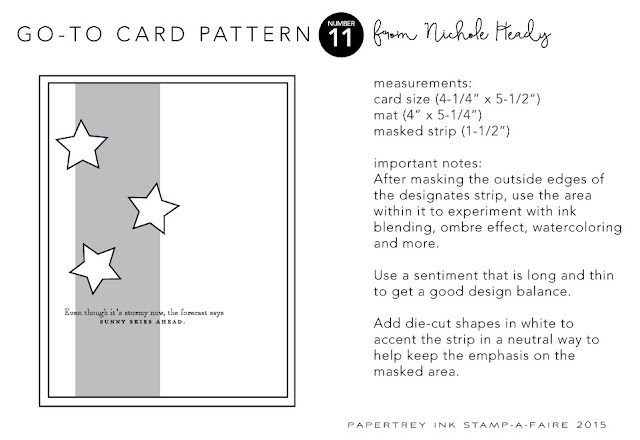 Each of the Papertrey designers will be featuring a Go-To Card Pattern, along with some samples. 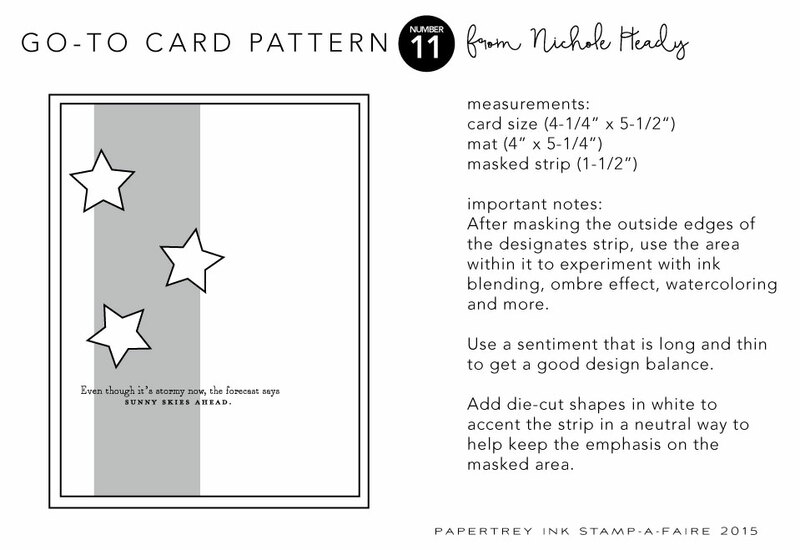 Your challenge is to create a card based on any one of these patterns. I'm excited to see everyone's creations! 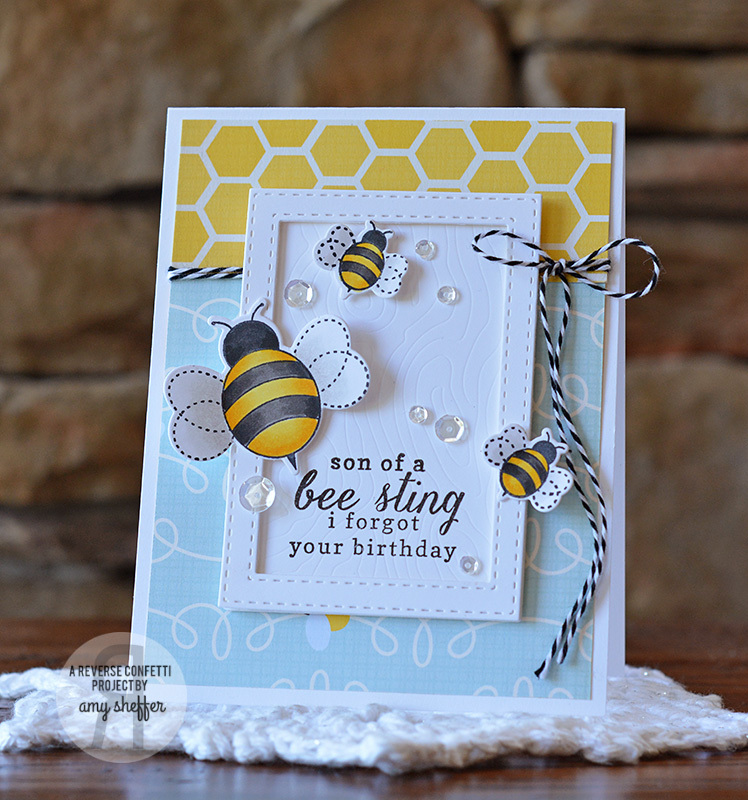 I'm working with Pattern Number 11 based on this gorgeous card by Nichole. I'm not usually a super technique-y person, so the opportunity to experiment within that masked off area was a challenge I was excited to take on. 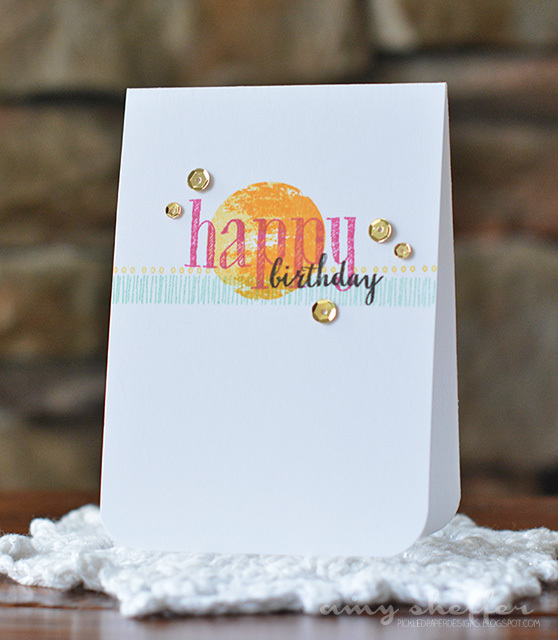 On this first card, I did some ombre ink blending on the background using Aqua Mist, Hawaiian Shores, and Tropical Teal. Before removing the masking tape, I added some black splatter, white splatter, and plain water splatter. 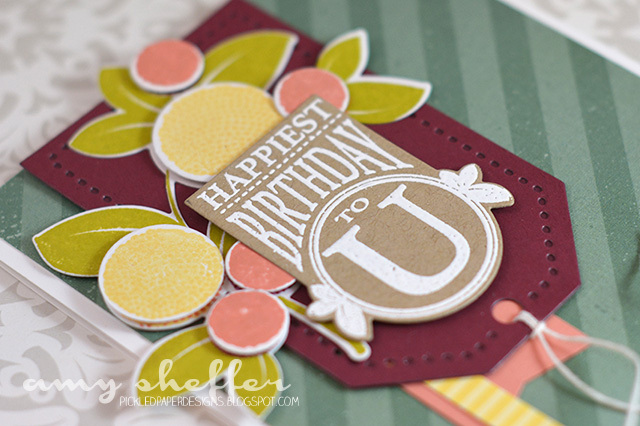 For the sentiment, I combined a Scripted die-cut with a Scripted stamped sentiment. 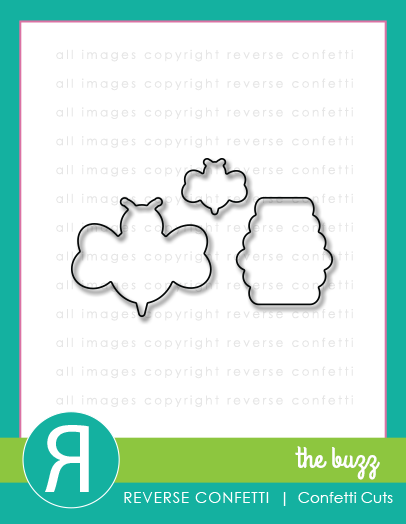 The white die-cut is from the new Leaf Silhouettes die set. For this next card, I experimented with some stenciling. I created a stencil by die-cutting Branching Out from card stock and using the negative as the stencil. I did the stenciling in layers -- first I sponged some leaves in Spring Moss, moving the stencil around to get good leaf coverage top to bottom. I then lightly sponged around the perimeter in Spring Moss (so that the strip would stand out agains the white card base). Next, I added some sponged leaves in Simply Chartreuse. Last, I added the darker leaves in Ripe Avocado. For the sentiment, I combined a thanks die-cut from the Wet Paint Cuts die set, along with a white embossed stamped sentiment from the Wet Paint stamp set. 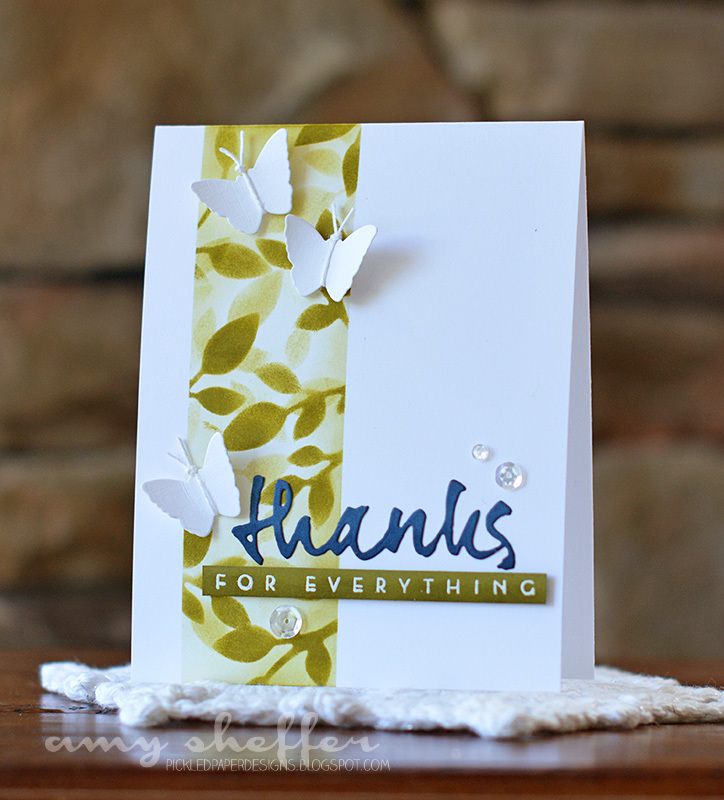 I accented with white butterfly die-cuts (from the Flower Favorites die set) and a clear sequin trio. Tomorrow, tomorrow, I love you, tomorrow, you're only a day away!!! What's happening tomorrow? 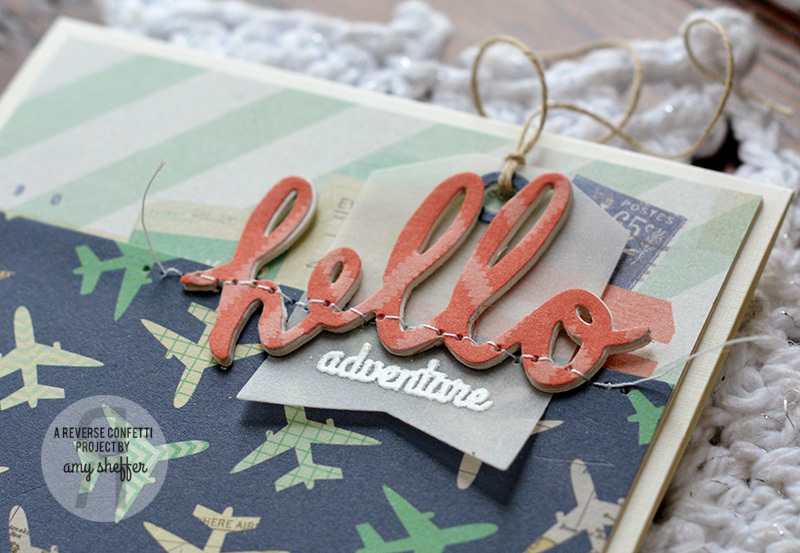 Papertrey Ink's Stamp-A-Faire 2015. I'm super excited -- this will be my first one! Please join us for a day of stamping, challenges, tutorials, and all-around stamping fun. The fun begins bright and early, at 7 am EST. Stamp-A-Faire is free and open to anyone and everyone! 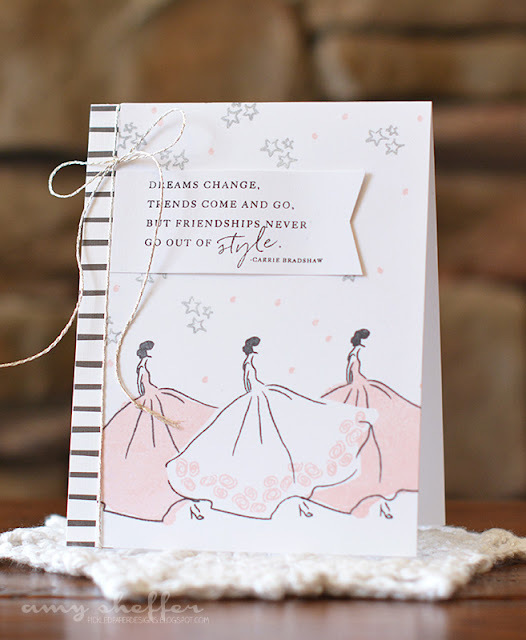 To whet your appetite for tomorrow's festivities, today the Papertrey team is sharing projects we've made with the 2015 SAF free exclusive set, Fashion Sense. 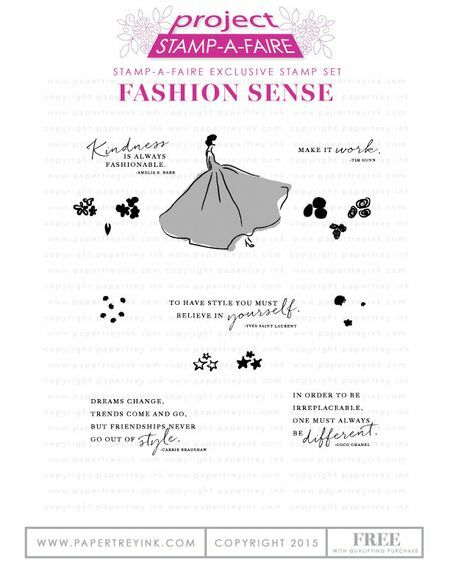 Fashion Sense will ONLY be available on Stamp-a-faire day to all customers who make a qualifying $100 purchase. All orders made between 7am EST and 11:30pm EST on Stamp-a-Faire Day (August 29, 2015) that total $100 (before shipping) will receive the set for FREE! This set is fabulous! I adore the designer-ready dress and the wonderful quotes. Who doesn't love a striking, bold red dress? I love all the options for customizing the dress. Ten thousand of us could design a dress and no two would be the same. But oh, that quote steals the show for me. 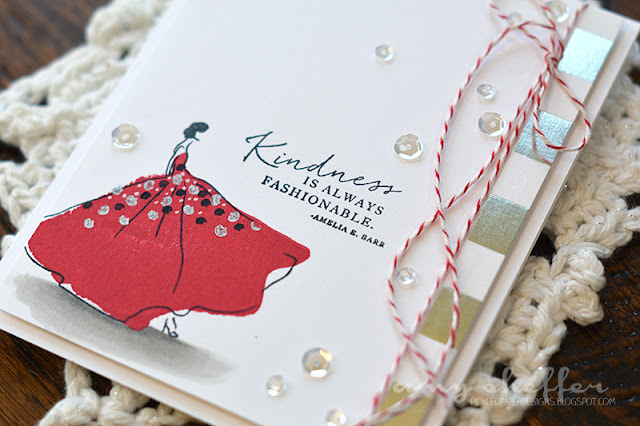 Yes, kindness is, indeed, always fashionable. We need more of it! I stamped the middle girl, then masked her dress before stamping the other two. 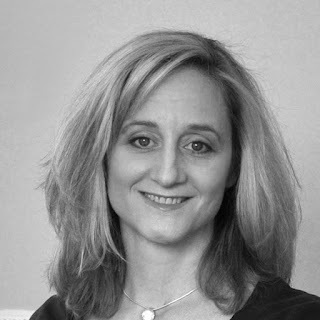 It's not perfect, but I think the sketched, artsy quality is very forgiving! Just a simple floral border along the bottom of this dress. So sweet! Thanks so much for stopping by! We have a fun surprise later tonight, and then we'll hope to see you first thing in the morning. Rest up! 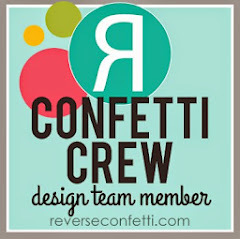 Reverse Confetti August SFYTT + Giveaway! 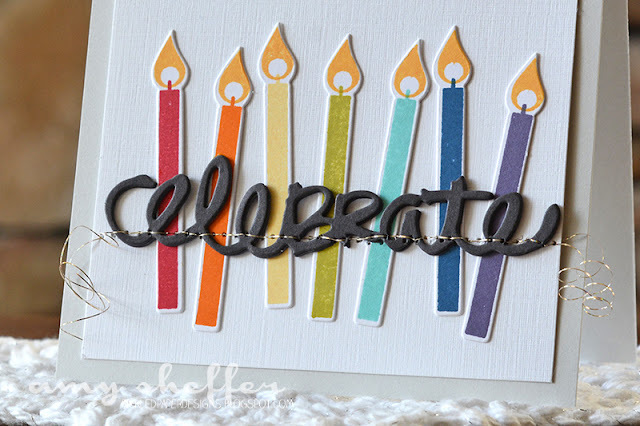 August is an extra special month for Reverse Confetti, as it's owner Jen del Muro's birthday month. To keep the celebration going, all month long the Confetti Crew will take turns giving away a stamp set. I'm super excited that today is my turn! 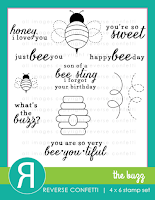 I'll be giving away The Buzz stamp set to a lucky blog reader. All you have to do is leave a comment here by noon CST on Friday, August 28. 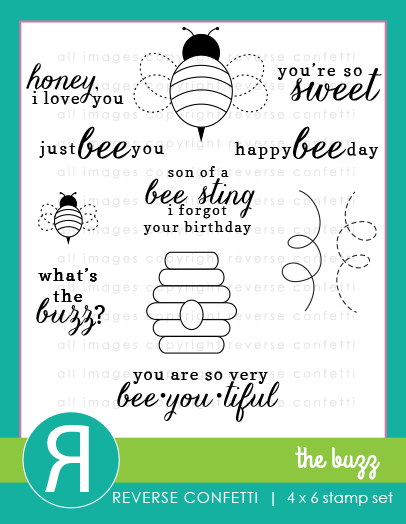 I've used my favorite sentiment from The Buzz for this month's Sketch For You To Try sample. 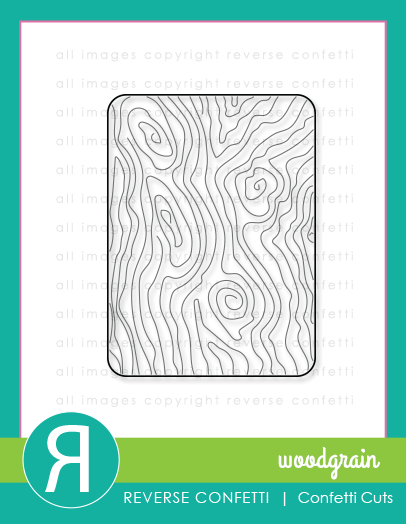 Have you played along with this month's sketch? The deadline is noon CST on August 29. Link up HERE. 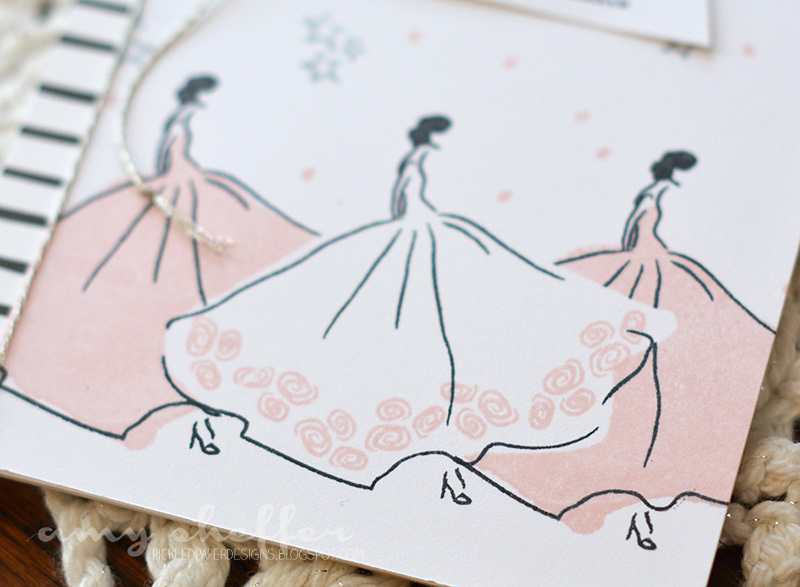 I pulled out some older Echo Park papers that I'm guilty of hoarding (but they're so cute!). 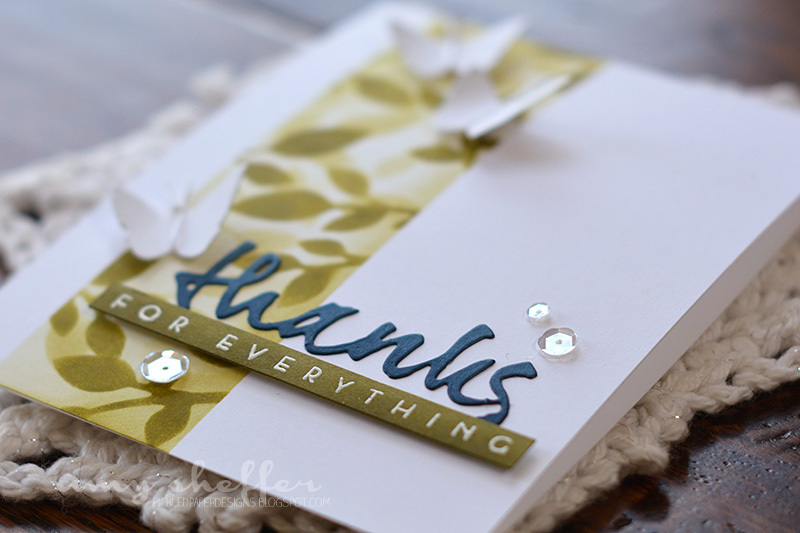 The background of the stitched frame is embossed with the Woodgrain Confetti Cuts die. 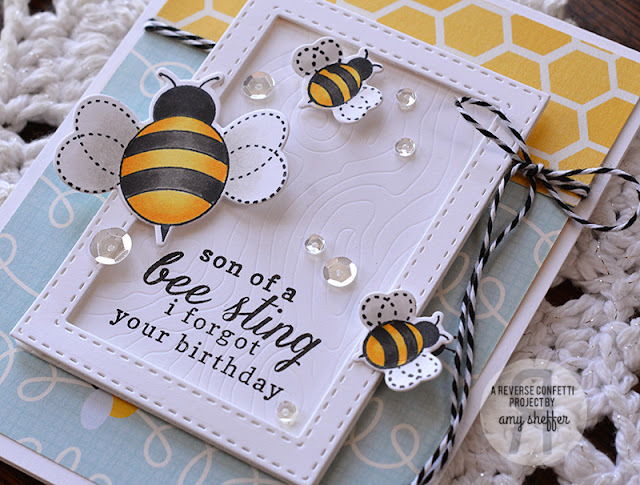 I stamped a few bees from The Buzz, colored them, die-cut them with the coordinating The Buzz Confetti Cuts, and adhered them to the frame. 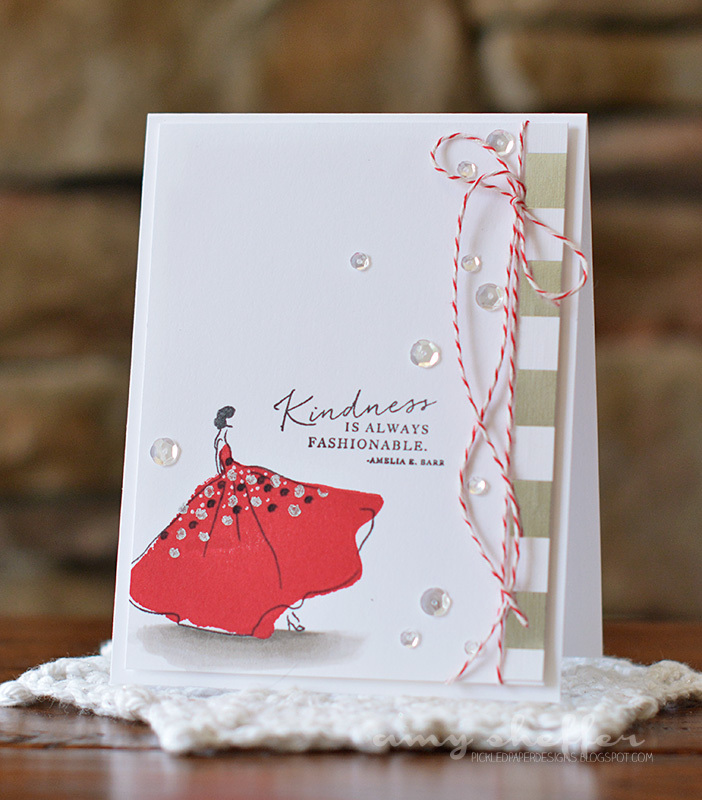 A few clear sequins and some black and white baker's twine finish things off. Congrats to Freshly Made Sketches on reaching their 200th sketch milestone! 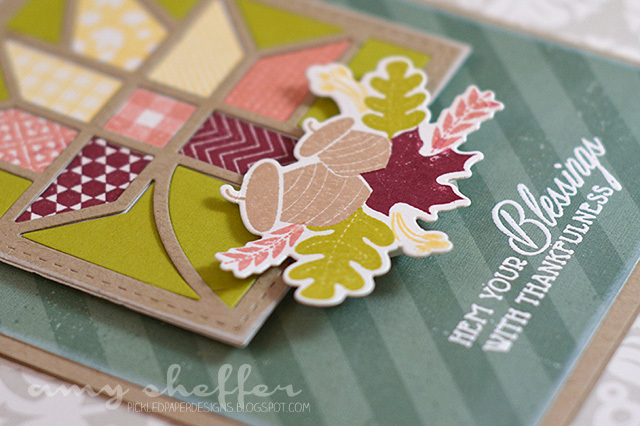 Reverse Confetti is sponsoring this challenge, so be sure to head to FMS for all the details. Cool sketch, with lots of room for interpretation. 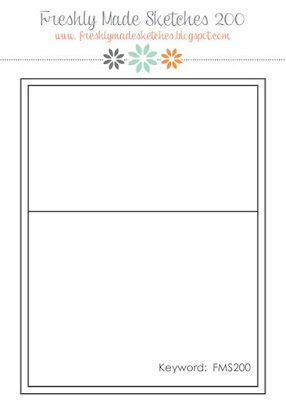 I opted for patterned paper for both panels with a sentiment cluster at the "seam." 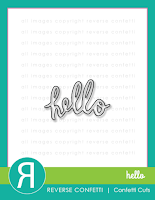 Hello was die-cut with the Hello Confetti Cuts die. 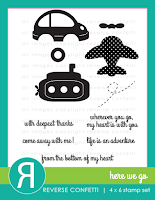 The word "adventure" is from one of the sentiments in Here We Go, and has been white embossed on a vellum Tag Me die-cut. The papers are from My Mind's Eye's Hello World 6x6 collection. Thanks for visiting! 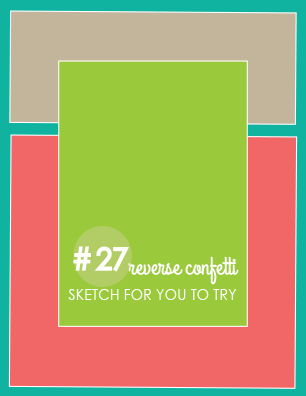 I'm hoping to see some Reverse Confetti creations in the Freshly Made Sketches link list for this sketch! Hello, friends, and happy Tuesday! Today's card features a simple black and white stamped background softened with sponging and vellum, along with a sparkly butterfly focal point cut with the gorgeous Elegant Butterfly Overlays die from Taylored Expressions. Hope you'll join me on the Taylored Expressions blog for more photos and how-to. 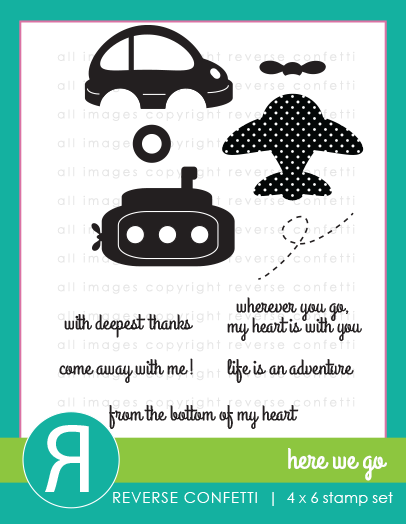 Who's excited for tonight's Papertrey release? 10 pm EST is the magic moment! I have a few more projects to share today. 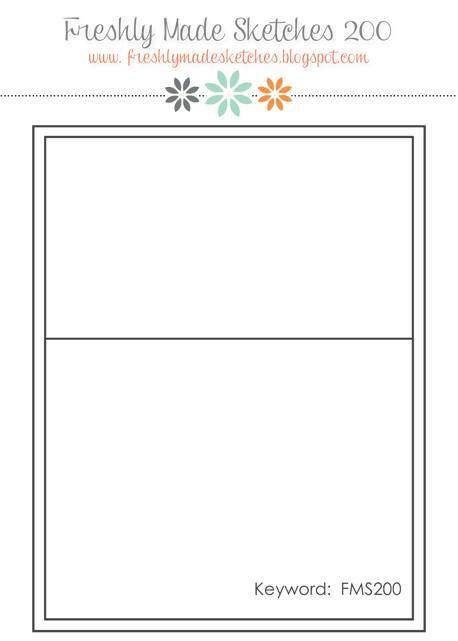 Most are super simple and straightforward, so I'll skip the chatter and the how-to for the most part. Supplies will be listed, of course, and as always, if you if you have any questions, just leave a comment or shoot me an email. 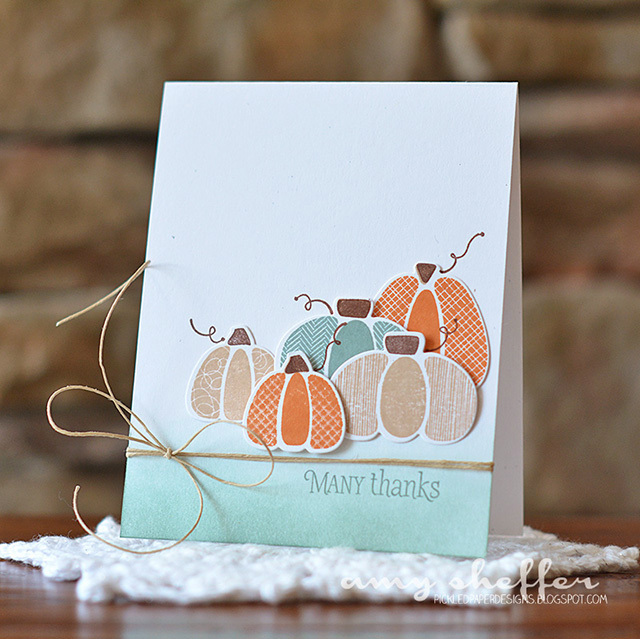 These pumpkins in Lizzie's Pumpkin Patch set are so cute! I love all the different patterns . 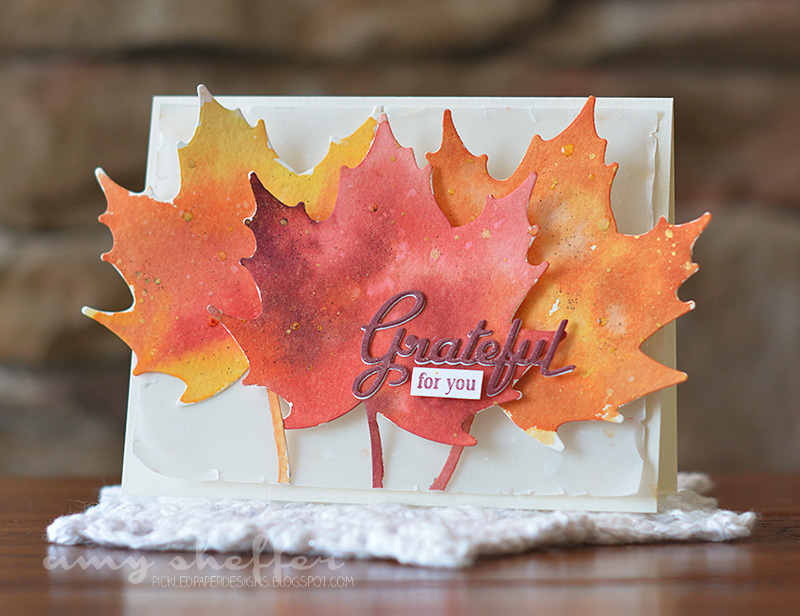 How gorgeous are the leaves from Dawn's Enclosed: Leaf stamps/dies? I watercolored the leaves using Distress Inks. 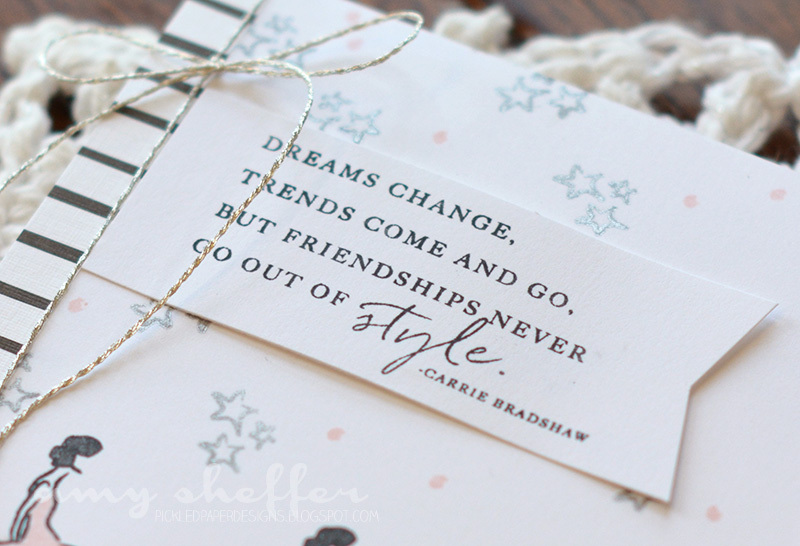 Scribbled Sentiments has such a playful, fun look. The circle was stamped with two impressions from the circle brushstroke in Brushed Off. The horizontal lines are from Southwestern Style. This fun color combo materialized in the scrap pile: Harvest Gold, Ocean Tides, Scarlet Jewel, Melon Berry, and Simply Chartreuse. 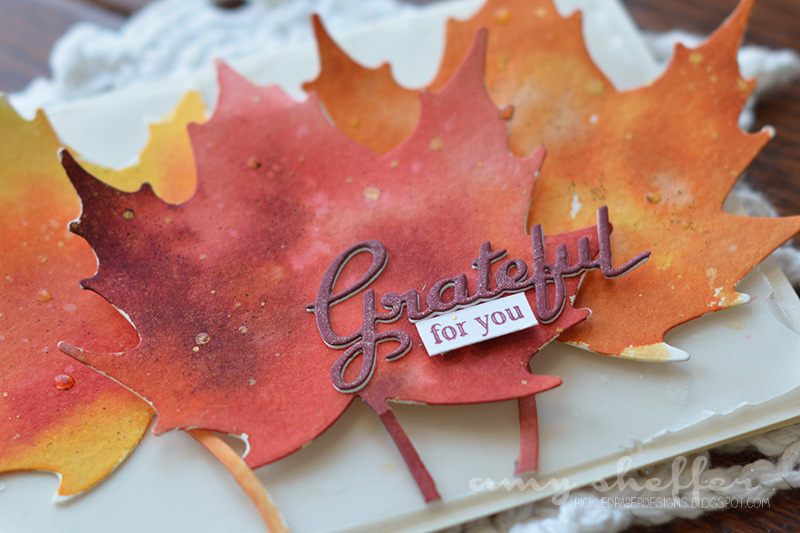 Images and sentiment are from Dawn's Fall Florals. 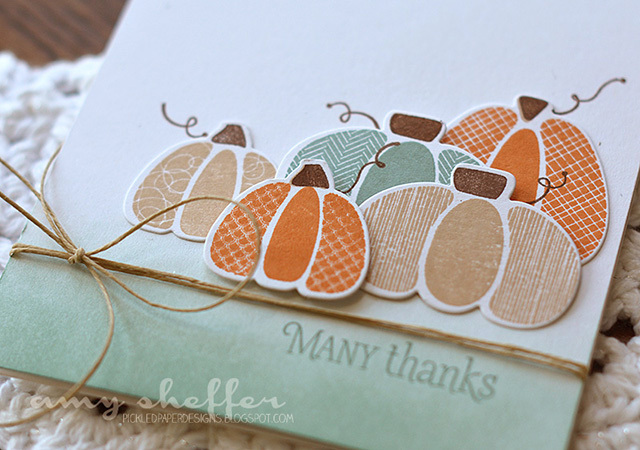 Background paper is from Heather's Twig Wreath collection. I'm really loving the bold, graphic and happy feel of Fall Florals! 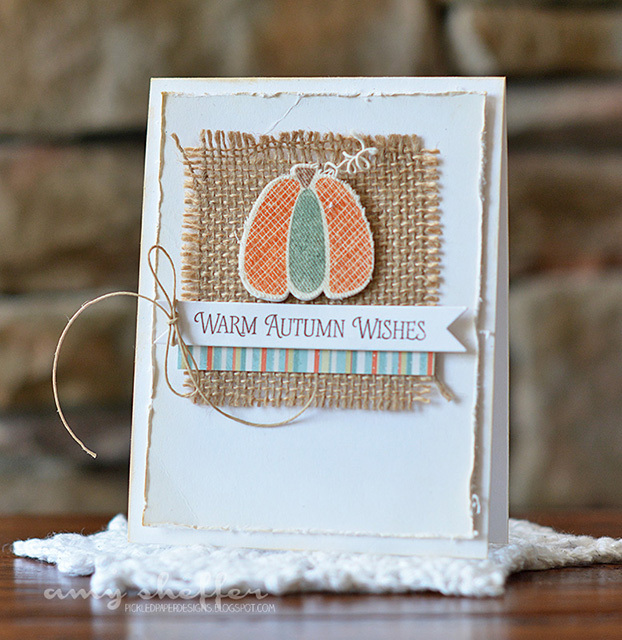 One last card, this one featuring Betsy's Quilted: Autumn.